Jerome, Arizona, was once a copper mining camp. It saw as many as 10,000 residents. But, during the Great Depression, ore deposits were exhausted and mines were shut down. The population dwindled quickly and was made up of less than 100 people by the 1950s. The city now resides as a National Historic Landmark. 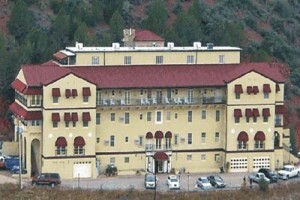 Within it, at one mile high stands the Jerome Grand Hotel. As guests walk through the hallways of this historic hotel, they’ll not only get a glimpse into the Jerome past but also have the chance to experience something paranormal. The hotel is said to be haunted. This is because, before it was the Jerome Grand Hotel, it was the United Verde hospital. Guests of the hotel have said to have heard coughing, labored breathing and even voices coming from their empty rooms. Some have even reported light anomalies and the television sets turning themselves on with no explanation. Those who wish to stay at the Jerome Hotel can choose the hotel’s ghost-hunting package. In this package, guests are invited to help with the hotel’s ongoing investigation of the supernatural and paranormal activities. The hotel provides ghost hunters with an MET meter, IR thermometer and digital camera to help the hotel document the spirits, orbs, ghost sightings and haunted happenings. Posted on July 30, 2014 by Gretchen Burnton in The Great AZ Road Trip | Tags: Arizona, Ghosts, Haunted, haunted hotel, Historic, hotel, Jerome, tourism, Verde Valley | permalink.